If you are reading this article on Monday morning (29 August), there is still a chance to take the children/grandchildren to the Imperial War Museum (IWM) Duxford for its Bank Holiday Battle of Britain Tour. Or a group of youngsters for an outing/party. Through the series of interactive sessions on offer, families can immerse themselves in the world of aviation and discover what life was really like for the men and women who served in war and conflict. In commemoration of the 80th anniversary of the formation of RAF Fighter Command, the airshow highlights Duxford's role as a wartime fighter station, looks at how the nation has been defended from air attack, and shows the vital importance of fighters to winning control of the largest battlefront on earth. A massed formation of Spitfires will take place on both days, consisting of 12 Supermarine Spitfires, including four rare Mark I Spitfires. Examples of these famous aircraft will fly in partnership with more modern types, comparing and contrasting skills and abilities, showing what it takes to be a fighter pilot. Standing on the ground, the experience of speed, power and agility of historic and contemporary fighter aircraft will be amazing as they dominate the skies over the one-time RAF base. The airshow starts at 13:30 both days but Duxford is very, very popular and advance booking is required. 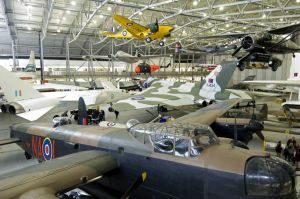 Duxford is part of the Imperial War Museums, which includes Lambeth on the site of the former Bethlem Royal Hospital, HMS Belfast moored on the South Bank of the Thames in London, the Churchill War Rooms in Westminster and IWM North (at The Quays, Trafford Wharf Road, Manchester). It is not to be confused with the RAF Museum, with its displays at Hendon and Cosford. Friendly rivalry is not a bad thing. The Army and Navy have fine exhibitions too. Duxford is Britain’s largest aviation museum. It started life in 1917 as a training airfield for the Royal Flying Corps. During the Second World War, Duxford played a prominent role during the Battle of Britain and was later used by United States Army Air Force fighter units in support of the daylight bombing of Germany. Be warned that a lot of walking is involved, the whole site covering 239 acres with the distance from the huge AirSpace hanger/exhibition to Land Warfare nearly one mile. There are plenty of fast food outlets (not cheap) and visitors are encouraged to picnic. 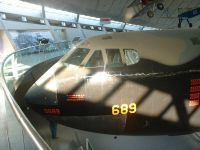 There are nine major points of interest, some housed in purpose-built centres (typically AirSpace and the American Air Museum) and others in former RAF hangars and huts, very well restored, an example being “Historic Duxford” opened last year, a simple exhibition with masses of memorabilia from the past 80 years. There are plenty of hands-on experiences for children. Pride of place must go to AirSpace (although our US cousins might argue regarding the American Air Museum opened by the Queen in 1997). As you enter, the conservation space hosts a Radlett-built Handley Page Victor bomber (XH648) under restoration. Similar aircraft supported the RAF Vulcan in the bombing raids on Port Stanley in June 1982. AirSpace is immense, providing 12,000sq m of floor space, with a large exhibition hall and a mezzanine providing views of the aircraft and interactive educational installations exploring aeronautical engineering and the principles of flight. More than 30 aircraft are on display, dating back to the First World War; early aircraft include rare examples of an Airco DH9 and a Royal Aircraft Factory RE8. The former is one of only six surviving DH9s and the only example on display in the UK, and the latter is the only complete and original RE8 in existence. More recent notable aircraft include a Hawker Siddeley Harrier which served during the Falklands War with No 1 Squadron RAF and a Panavia Tornado, which flew the highest number of bomber sorties of any Tornado in the 1991 Gulf War. Also on display is a British Aircraft Corporation TSR-2 strike aircraft, one of only two survivors from the cancellation of the project in 1965. 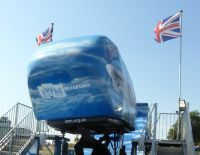 Recent additions include Eurofighter Typhoon DA4, which was donated to the museum by the Ministry of Defence 2008. Civil aircraft include the Duxford Aviation Society's (DAS) Bristol-assembled Concorde development aircraft, Hatfield-built De Havilland DH106 Comet 4 G-APDB, the first jet passenger aircraft to fly the Atlantic in November 1958 (with due reference to Sir George Edwards, whose Viscount turboprop demonstrator did the same thing somewhat earlier). One could argue that the Handley Page Hastings was a passenger aircraft, in fact a troop carrier. Another Handley Page design is also on display, a Hermes, and with four engines closely related to the RAF machine. Just 29 were built. This the only survivor, after ending its days as a cabin trainer with Dan Air. Now called Horsa, it is in the hall, but with the wings removed. Lined up on the apron are a group of British civil aircraft from the 1950s, part of the DAS collection. As it is a completely voluntary organisation, not all the aircraft are always open for viewing. Parked separately was a pristine Catalina and Sally B, a Flying Fortress B17, was on the flight line. Many of its 850 objects on display have never been seen before by members of the public. The museum said the attraction tells the story of the British-American relationship in "human terms". It includes personal accounts and the stories of people ranging from pilots to a female riveter who built aircraft, and an African-American engineer who built airfields. Nearly 20 aircraft are on display, some suspended as if in flight. With this short piece, I have not mentioned that on most days you can take a flight on a DH Rapide from £99, or a Spitfire starting at £2,995. Or stay on the ground in a simulator. Children from £3. Other exhibitions include Air and Sea, Conservation in Action, 1940 Operations Room and Land Warfare. And to put it in even more perspective, in 2018 the Royal Air Force celebrates 100 years. Perhaps the most important thing to reminisce on is just how Britain led the world in aviation innovation for perhaps 60 years, with the Hurricane and Spitfire of 1938 until the last Avro 146 came off the line in 2001. We do still produce military aircraft, but for how long? Good piece, Malcolm. Readers might want to consider a visit on Remembrance Sunday - admission charges that day are a person's chosen donation, and a really moving remembrance service is held in 'AirSpace'.